The body is a zealous guardian, and the brain its prized asset. To keep the brain - three pounds of jelly packed tight in innumerable folds - protected, the body isolates most of it from the bloodstream. Doctors call it the blood-brain barrier. So, a vital question while dealing with a tumour inside the brain is: how does a drug dose breach this barrier to reach the tumour site? It is a question oncologists have grappled with for long. It is also one to which Jiban Jyoti Panda, a PhD from the International Centre for Genetic Engineering and Biotechnology, or ICGEB, in Delhi may have an answer. "The brain is very selective in choosing what goes inside it," she says. "Only a few molecules, like amino acids, can enter the brain from the bloodstream." Thus, when a patient is given a drug to tackle a brain tumour, as little as two per cent of the dose may actually get past the barrier. It means doctors have no option but to perform an invasive surgery or procedure. The alternative would be a kind of shock-and-awe strategy of pumping the patient with large quantities of the drug, so that somehow the requisite amount to destroy the tumour enters the brain. The collateral damage for the surrounding issue, which absorbs the remaining dosage, may be considerable. "Even a little toxicity will damage your brain," says Dr Panda. Now, she and her doctoral advisor, Virander S. Chauhan, who is also the director of ICGEB and a PhD from Oxford, say they are researching a more elegant means of delivering drugs to the brain or the retina, where a similar barrier exists. 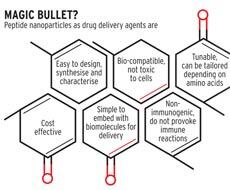 It consists of using peptide nanostructures as drug delivery systems. Just what are peptide nanostructures? Peptides are building blocks of amino acids inside proteins that hold the protein together. Peptides can self-assemble to form a structure at the nanoscale - several powers smaller than the breadth of a human hair. The idea is to insert the drug dosage inside the building blocks, since the body does allow amino acids past the bloodbrain barrier. The drug is passed into dipeptides (or very short peptides, just two amino acids linked together). Jyoti Panda says developments in nanotechnology that allow such nano-tinkering are all fairly recent. She mentions a 2003 research paper by Israeli scientists, published in the journal Science, titled Casting Metal Nanowires Within Discrete Self-Assembled Peptide Nanotubes, as significant. But Chauhan says the paper merely provides an example to show that very small peptides can selfassemble. It was not any particular paper but overall developments in the nanosciences - and the fact that peptides are extremely bio-compatible - that threw up this possibility. What hits the nail on its head is that it may be possible to customise the peptides carrying the drug to target specific tumours. As the cancer plunders cells to fuel its growth, it could be fooled into devouring a drug dosage disguised as a resource. "Cancer cells differ from normal cells in many ways," says Chauhan. "One of these differences is that cancer cells have specific molecules overexpressed on their surface. If the delivery structure can be made to recognise those specific molecules, and thus identify the cancer cells, then obviously this kind of delivery will become more specific. Peptide-based nanostructures allow us to place these recognition motifs for cancer cells on them." Their unpublished results have been promising, he adds. The hope is that the delivery system will move out of the laboratory to be taken over by industry for commercial production. In March, Jyoti Panda was awarded a fellowship by the cosmetics company L'Oreal to work at the School of Pharmacy, University of Colorado, US, on customising nanostructures to target specific types of tumours. Indeed, peptide-based drug delivery systems have attracted attention from even Swiss pharma giant Roche, which had agreed last year to pay as much as $1.1 billion or Rs 4,950 crore for a technology called stapled peptides. In India alone, the market for drug delivery systems would be at least Rs 13,500 crore, according to Dr B.S. Ajaikumar, Chairman and Managing Director of HCG Enterprises, an oncology care and research institution. "Targeted delivery platforms, even using systems other than nanotechnology, are being studied to tackle cardiovascular diseases, diabetes, hepatitis, HIV and cancer," says Dr Chandrashekhar Potkar, Director, Medical and Regulatory Affairs, Pfizer India. But challenges remain. "The use of nanotechnology in drug delivery will not work until we have effective quantifiable bio markers for all cancers," says Dr Ajaikumar. (Bio markers are characteristics of cancer cells that render them identifiable.) "We have bio markers only for breast cancer, colon cancer, and lung cancer. The challenge is to discover all the bio markers for each cancer type." Based on these receptors, it is possible to develop effective drugs to work only on cancer cells and not on normal cells, but the catch is that each cancer type may express multiple receptors requiring multiple drugs. As Dr Ajaikumar sees it, "Cancer is not a single disease. It is like different diseases throwing a surprise at us when we think we are close to the treatment. It is elusive and it undergoes mutations, which makes it more difficult to come up with a single answer."